The new ongoing Marvel series, Poe Dameron, has not only brought us new adventures of the dashing Resistance pilot Poe Dameron, but also a new mystery concerning a close family friend and veteran of the Rebel Alliance, the Duros pilot, L’ulo. 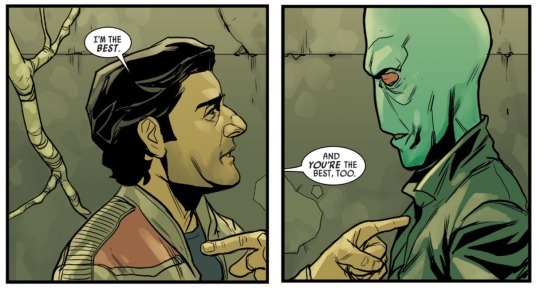 As we have previously discussed, L’ulo was introduced in Star Wars: Shattered Empire as a friend and fellow fighter with Dameron’s mother, Shara Bey, and was also referenced in Poe’s story in Before the Awakening. When Poe Dameron premiered, the pilot was tasked with gathering the best pilots of the Resistance for his mission to find Lor San Tekka, the mysterious older gentleman from the beginning of The Force Awakens. Among these pilots was L’ulo, complete with the same A-wing he flew during the Galactic Civil War. While L’ulo’s inclusion was exciting, it also raised a troubling question: What happened to L’ulo between joining Dameron and not appearing in the Resistance attack on Starkiller Base? A real world answer would be that the idea to bring the Duros pilot back for the comic title came about well past the time for any idea to include him in the film, but the writers are faced with answering this in-universe question. 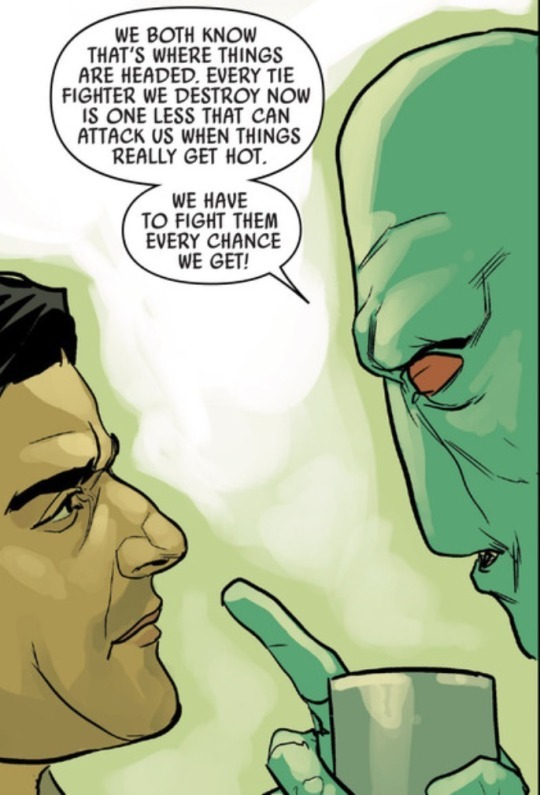 Since issue four went up for sale, those writers might have dropped a hint of that answer in a conversation between Dameron and L’ulo. Summarizing the conversation, Poe very gently reprimands L’ulo for his aggressive actions toward starting a dog fight with the First Order fighters in the previous mission. He softens his order to L’ulo to set aside the Durosian’s idea of eliminating as many of the First Order now, before the true war starts, by explaining that it’s simply not time yet. It is a little hard to read L’ulo’s reaction, but it does not appear that the Durosian took it entirely well. And like that, Poe Dameron introduced two potential answers to why L’ulo is absent in The Force Awakens. The first answer may be that L’ulo’s aggressive tendencies will ultimately get him killed, which, while a seriously depressing end for our favorite Durosian, would provide even more background motivation to Dameron’s fight against the First Order. The second answer is a little brighter, but only in context with the first. L’ulo leaves Black Squadron and the Resistance because he is unhappy with the current strategy of waiting. For Dameron, it would be like having an uncle turn his back on him, emotional and significant, but at least, L’ulo would survive to reappear later. Unfortunately (or fortunately? ), with no immediate end to the Poe Dameron series in sight, the definite answer will probably remain a mystery for many issues to come. When that answer might occur, it will be one of the big events of the series and undoubtedly, either help cap a dramatic storyline or possibly, even be part of the conclusion of Poe Dameron. Until then, keep flying safe, L’ulo!